The legend tells us about Emanuil, son of a mighty king and of his extraordinary queen. This queen, Emanuil’s mother, was a strange person: she had the healing gift and with only one touch she could relieve the pain and sufferance of people. People from all over the place came to her to be cured of any physical or spiritual distress they might have. Unfortunately this much beloved queen had enemies, mean people who wanted her cast out of the castle and after a while they really managed to persuade the king to banish her from the palace.The queen was very sad and although she was in exile she continued to cure ill people. After a while she died of sorrow. Emanuil was the most affected although he was not allowed to see much of his mother during the past years. He ran away from the court and no one knew where he had disappeared. The king was dark and surly as his own son and heir vanished like that and could not see any reason for Emanuil to do that. The truth was that Emanuil was in deep sorrow after his dear mother and retreated to the mountains, to a mysterious eremite, an old friend of the queen. Emanuil cried and explained to the hermit how blue and lost he felt and begged him for advice and guidance to become a good person. After calming him down the wise hermit advised the lad to go back to the humans and serve them: if he wanted to be good he had to learn to be humble and to do good deeds without asking for anything else instead. The young man decided to go and do it exactly. The first person he met on his way was an old lady who was carrying a heavy bunch of fire wood. Manuil offered to help her with the burden. He wanted to take farewell when they reached the woman’s cottage but she wanted at all costs to offer him a good meal, shelter for the night and pay him for the work done. The day after, before his leaving she made him a strange gift (probably the old woman was a sort of a witch): all the good or harm he would do to people to turn back to him. Further on Emanuil found a man who has fallen from a rock and was badly injured. He took the man home and took care of him but in the end the man died, leaving behind a beautiful young daughter, Rada. The prince promised to the father to take care of the girl. After the man passed away Emanuil and Rada went up to the mountains where he left her to the hermit to be raises and tutored by the wise man, so she could become a good wife for the prince when she grew up. The prince went back to the people where he continued to help the poor and needy. After a while he realized he wanted to do something more, to do something to improve himself, to become a literate and a wise man. He decided to study medicine and that is why the prince became apprentice to a chemist. With the money earned he paid his studies and became a good doctor. One day the hermit paid Emanuil an unexpected visit – he came to let the prince know that Rada found herself a fiancé in the valley and wanted to marry him. The young doctor lost his temper: he shouted at the hermit and pushed him so brutally that the old man lost his balance, fell, hit a rock and died. Emanuil was inconsolable – he could not forgive himself for what he did and retreated far away on a mountain. He continued to cure people for free but became such a surly and unhappy man. No one knew his name and no one dared to ask so they called him simply “Omul” (the Man). He remained there for many years until one good day Rada and one of his old servants from the court appeared in the solitude of his cave. They prayed him to come back as his father was dead. Rada explained Emanuil she was not married and that story was only a test of the hermit… the prince was left speechless but when people from all over who were helped or cured by him arrived to thank the prince, a smile appeared on his face after many years and he came back to the castle and made Rada his queen. They lived happily together and had many children. 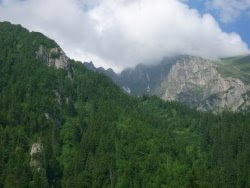 The mountain where the hermit and then Emanuil lived once was still called “Omul”. 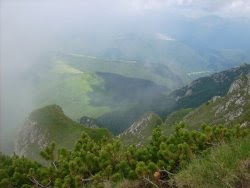 True facts: Omul mountain is the highest peak of Bucegi chain. Its height is about 2505 meters and on top of it there is a weather station and a tourist chalet, which make Omul the highest spot of Romania to be permanently inhabited.